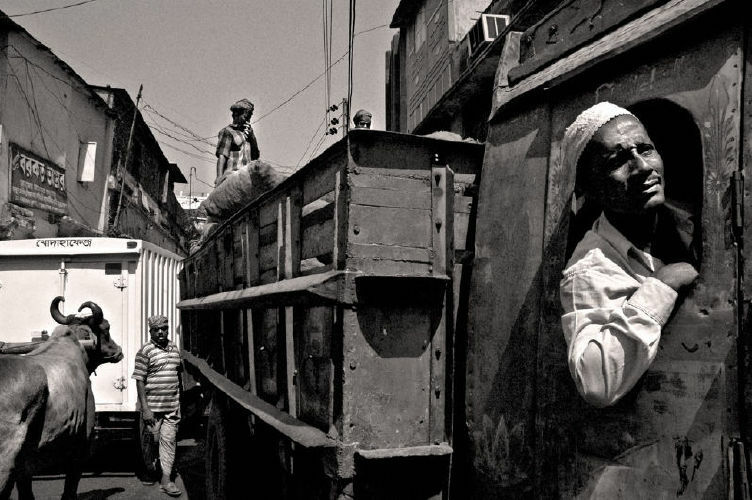 Puran Dhaka, or Old Dhaka, was a rather unlikely subject. For it existed all around me. I live here. It was almost trying to find the unseen within the everyday. 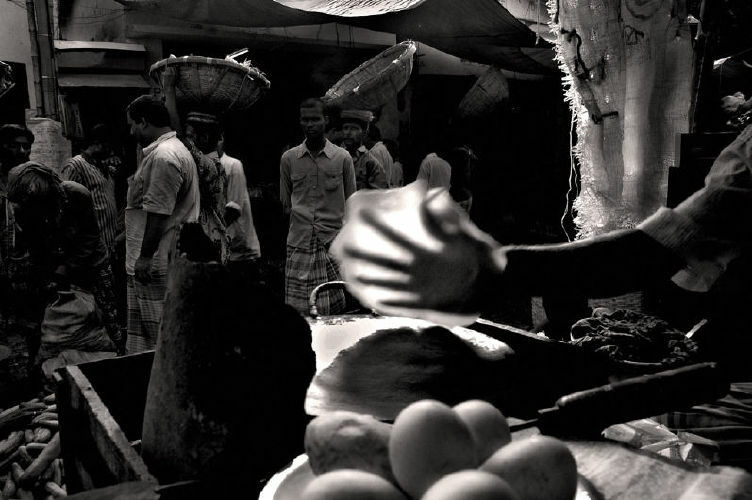 Old Dhaka had made me appreciate properly cooked greasy food, the sleaziest of slang, and it is where I had come to rediscover the same small town pulse of holding on to things than letting go. My own childhood years in Comilla, a small district town surrounded by mostly rural settings and steep with customs and old world lifestyle, had made me not just appreciate but rather feel at home with relations which emboldened from the duration of time spent and bordered on tradition more than trend. 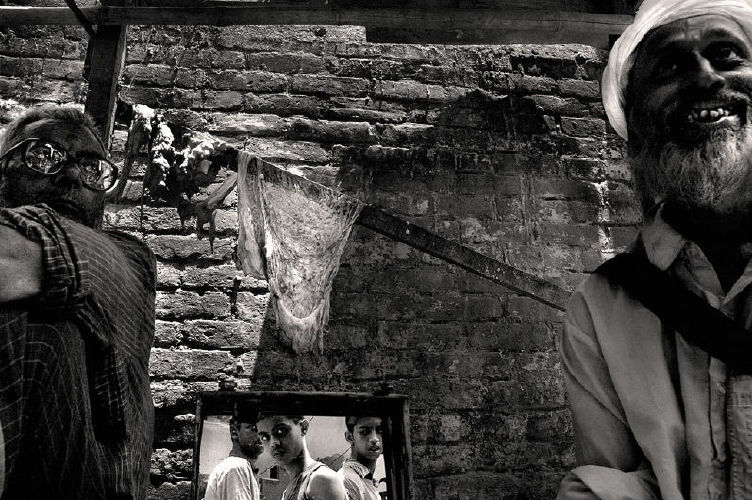 But through the frames, my Old Dhaka started to divulge unseen lives and throw back at me more agonising questions of assimilation, and even worse, deletion. As I started to see, the world that was just ordinary and domestic started to unravel in an intricate web of ages-old wisdom and tradition. Festivals, like Holi celebrated with all its grandeur at Shankharibazaar, which had seemed as just fun with throwing colors at one another revealed with all the bonds of belonging, spiritual continuity and rejuvenation. 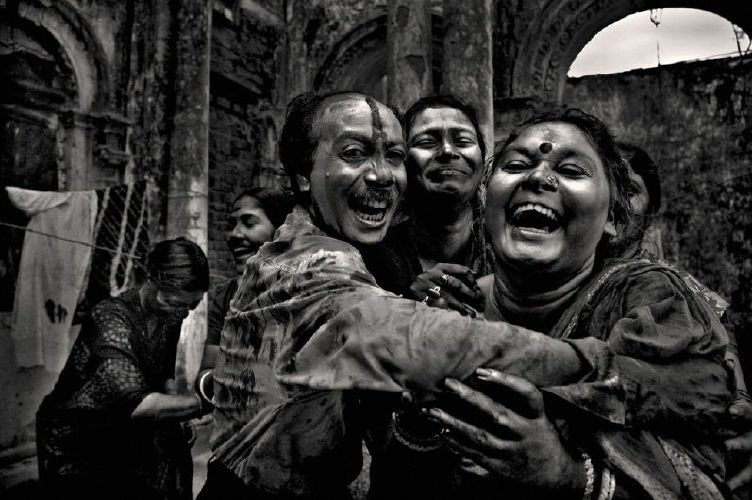 It ceased to be a mere Hindu festivity, but more so of celebrating the joy of being. 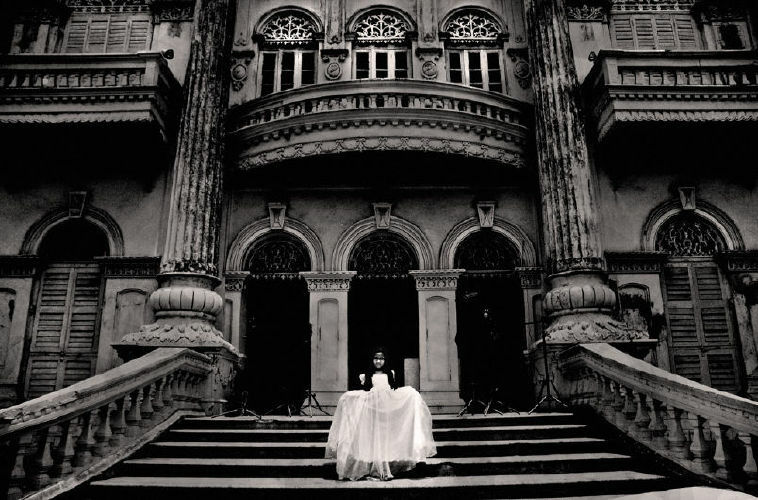 Old, regal structures which had just seemed as edifices were now symbols of 'living art'. 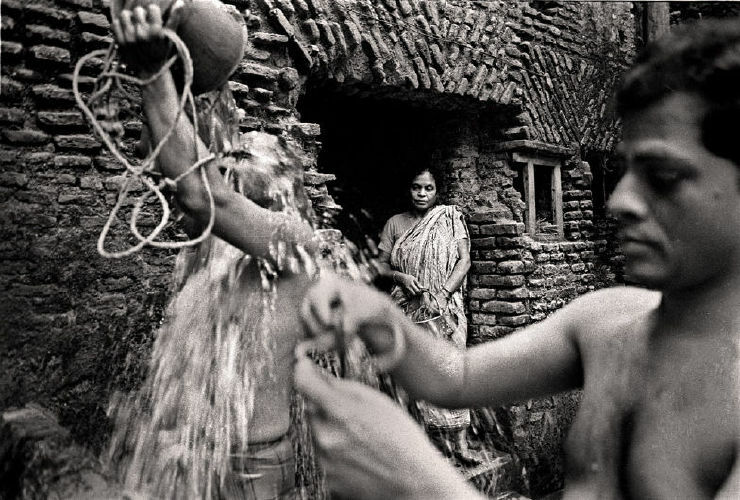 The common sight of mothers' bathing their children in the small courtyard and tired, old horses pulling carriages, which had long ceased to be any 'real' form of transport, were becoming dots in a matrix where living meant progressively building on what you have and not deleting structures, customs, ways of life which had come into place over centuries. It took time, but with every passing, I realised why Sumitra Debi of Bonogram wants her own house and those surrounding it to retain their own place. They were not houses, they represented her sixty hears in this world. It is time and the lives. Lives lived within the confines of walls breath with those structures and their collective consciousness makes the fragments into a whole. Words such as family, tradition, belonging mean a lot here. In fact, they are what bind. The ether filled with collective growth is one that cannot be touched or seen. It is lived. Old Dhaka ceases to exist as just an area, and the streets I have called my own become one singular space which I call home. 1. A young mother cleanses her daughter’s hair of lice as they stand in the sunshine on what passes for their balcony. Such intricate relationships, a part and parcel of life in those parts, is fast becoming a thing of the forgotten past in the humdrum of daily life. 2. 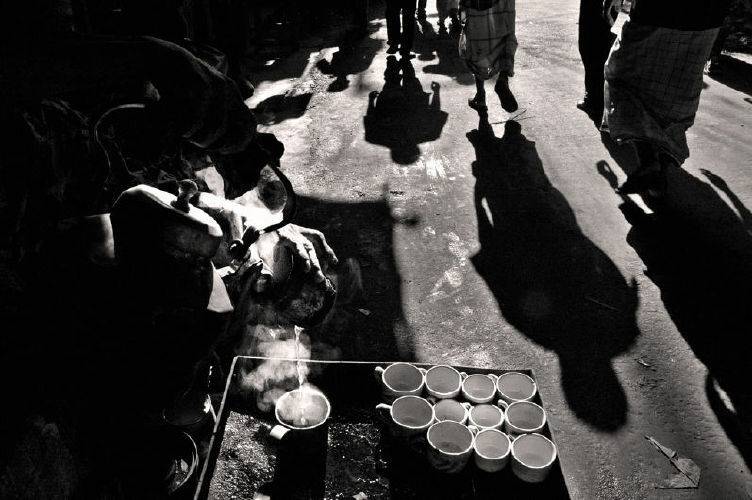 A man sells tea during late afternoon. 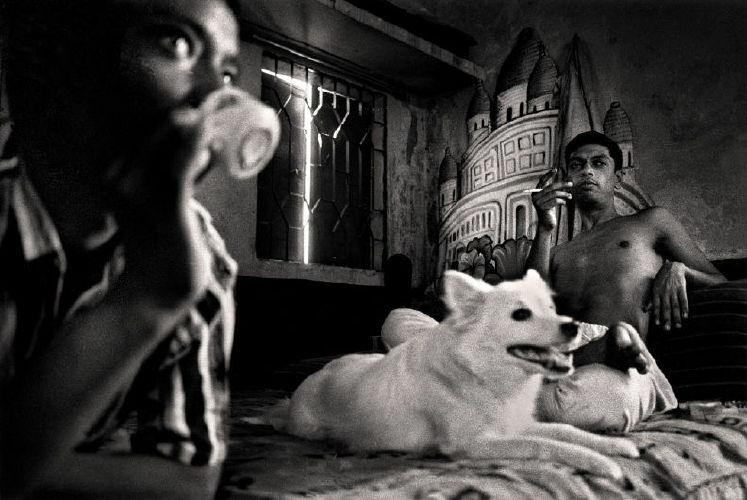 Tea vendors are a common sight in these part and people often indulge themselves in late afternoon tea and adda. The relationship is slightly different than the average shop because the tea vendor too belongs to the same community. 3. 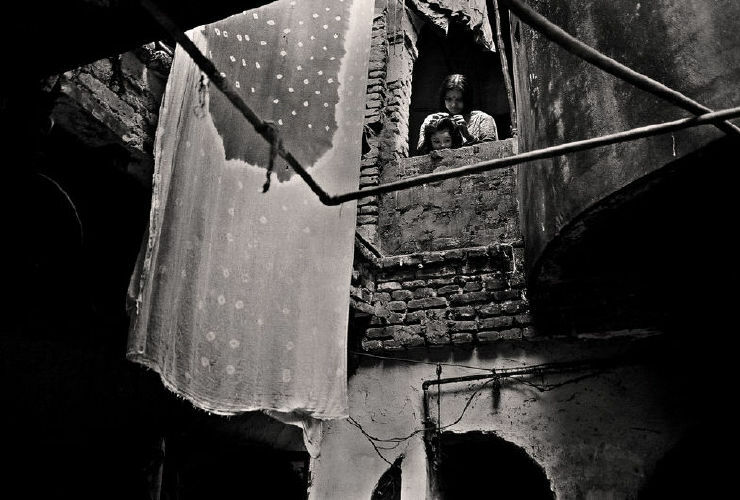 In Old Dhaka this is almost a matter of course what with many families residing in one house. This gives off the feeling of belonging to an extended family. The community feeling is very evident even amongst males and females. 4. Life is a wheel or so they say and the grandmother helping her old husband to the bathroom while their grandchildren play by their side, show it better than anything else. The old man passed away fifteen days later but there are plenty of young to take his place. Yet. 5. Pintu, pictured here is one of the first people to voluntarily offer me his help. A uniquely colourful character Pintu and his group of friends, although more talk than anything else, still provided for a stretch of comic relief. 6. Sunlight is reflected on a roti prepared by on a street side shop. Located in Shambaazar, Sadharghat the site of the largest wholesale market in the country, the day begins early for the people who live there. 7. 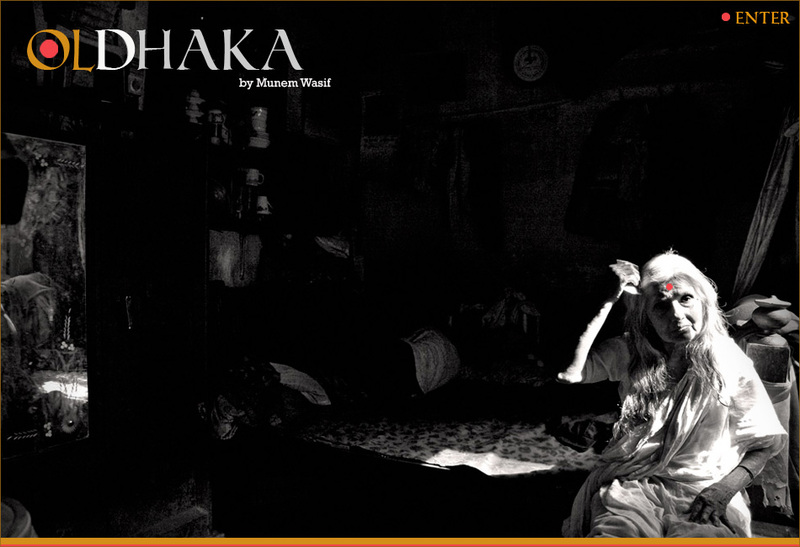 Providing Dhoop in shops is a common daily ritual followed in Old Dhaka. 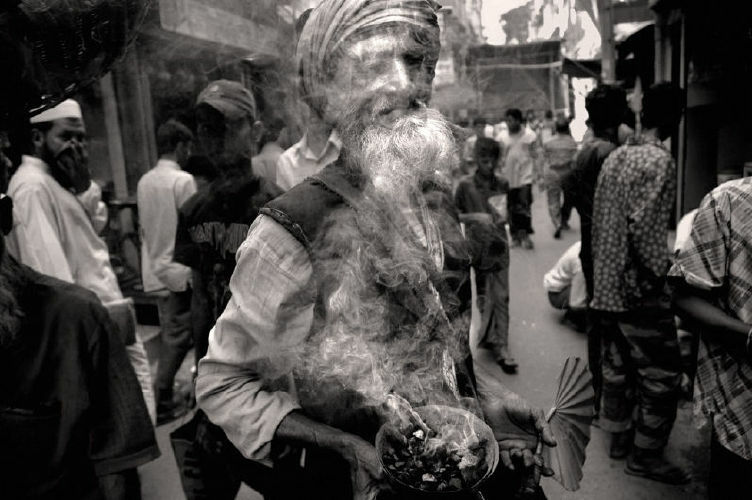 Originally borrowed from Hindu culture it is commonly believed that providing dhoop in shops will provide a touch of holiness to the daily dealings. The man providing the dhoop is paid voluntarily but he is seen as a huge part of the society and his work much appreciated and not seen as just a matter of rote. 8. Located in Bonogram, these sets of buildings are set for demolition paving the way for new modern flats. The news does not rest well with Sumitra debi, who has been an inhabitant of this locality for sixty years. 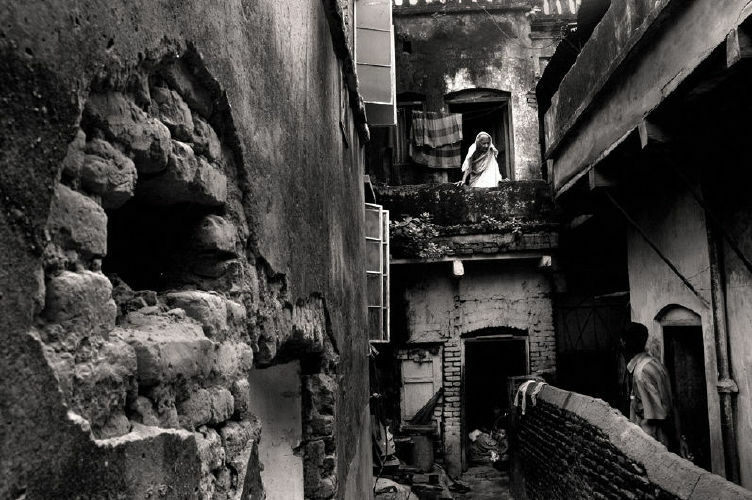 She thinks that demolishing the buildings will not just cause a loss in the locality but also damage the whole neighbourly spirit that is prevalent at the moment. It is a sign on the changing culture and times. 10. 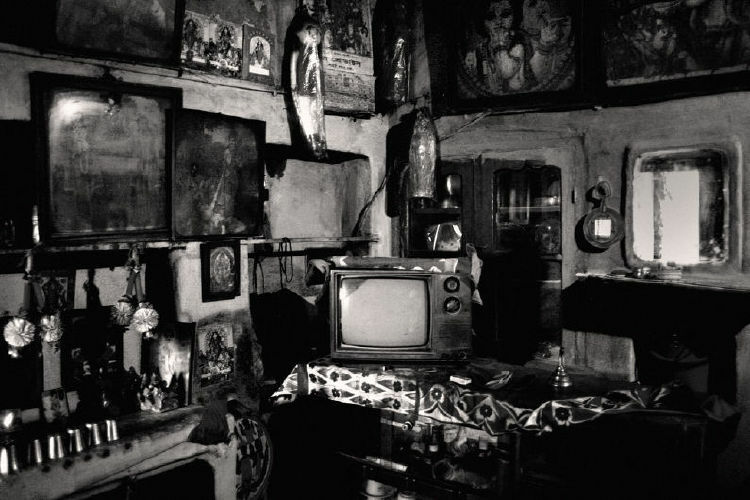 A feature of a common room in old Dhaka. 11. 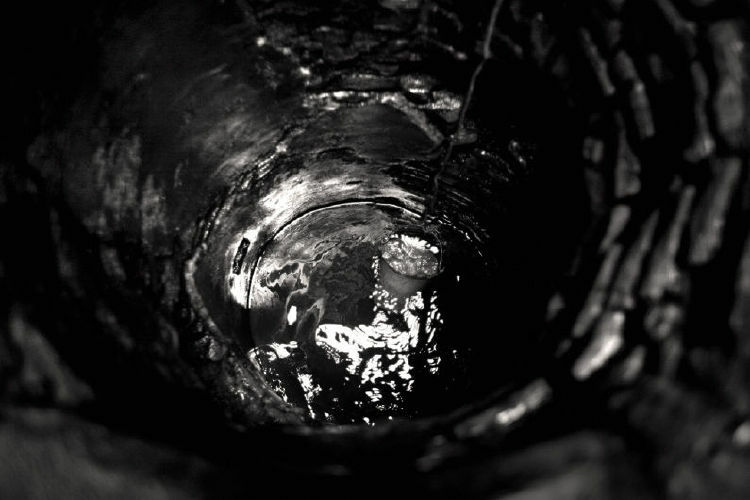 A man is talking water from Kua (water tank) in old Dhaka. 12. 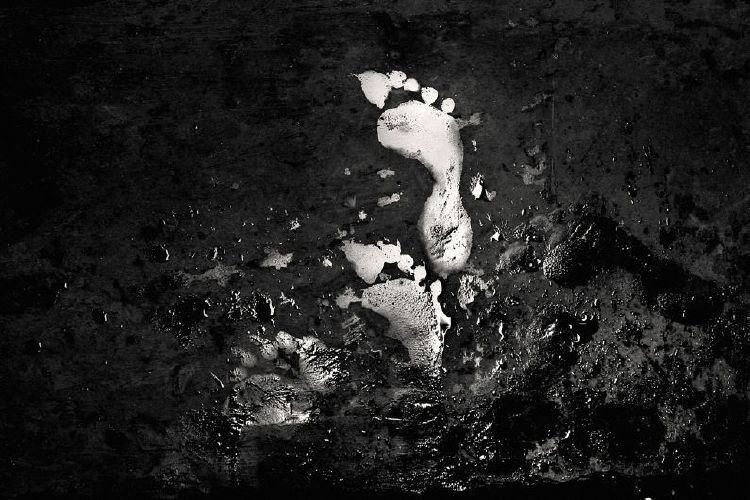 Footprint of a woman. 13. 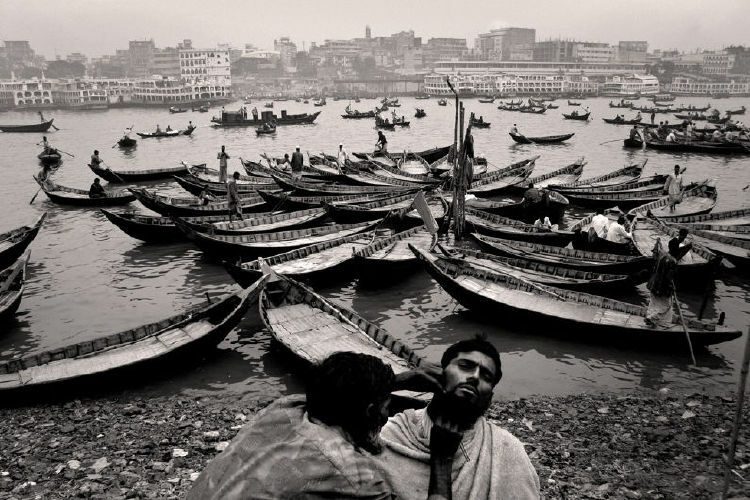 The ferrywala is a lost part of our culture in these days of separate flats. It is still very much in vogue in Old Dhaka though. 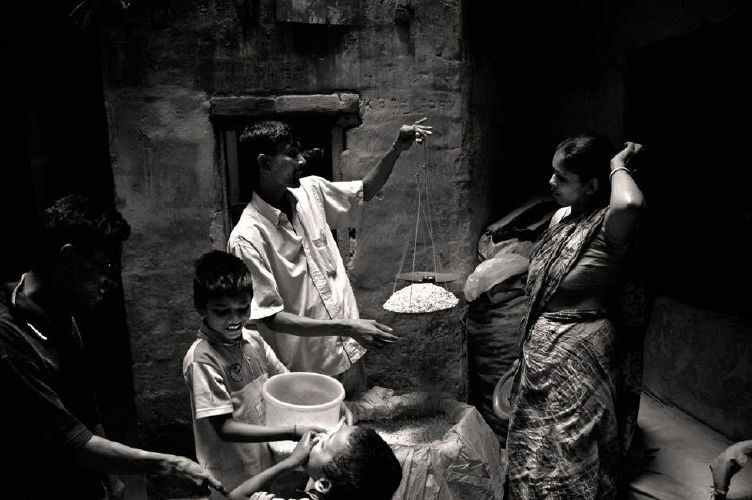 This man weighs up puffed rice and sells while the house-wife bargains. It is a scene lost these days. 14. This barber has been in work since Liberation which is as more than most of his customers can recall. 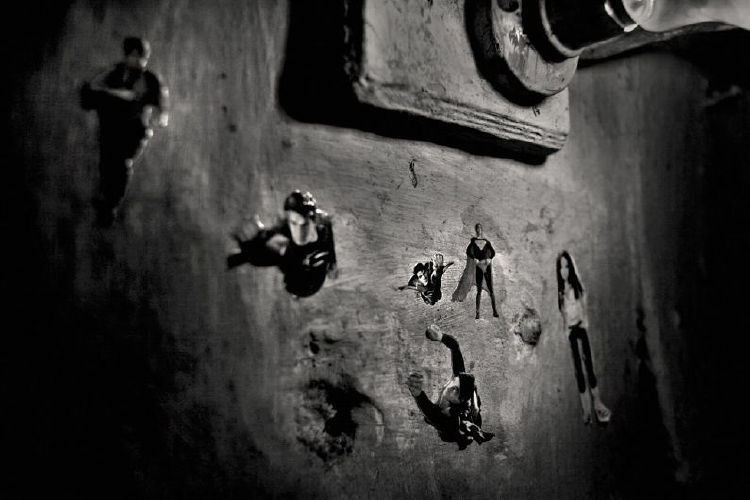 He has no definitive structure in which he carries out his work but it is this very informality that is endearing. Early morning, with the river as backdrop and only his hand and eye to guide him. 15. Asif Azim, is a top ramp model of Bangladesh and has adorned almost all the glitzy showbiz locations. In another life though, he lived in Lalbagh and was one these very people. He is one of their very own and also one who provides an inspiration for the many who live here. 16. 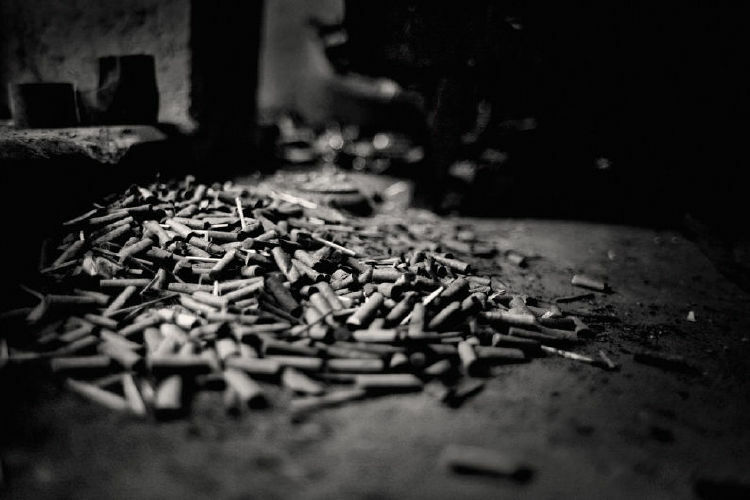 Numbers of cigarette’s left over’s are being left in the corner of the room. 17. 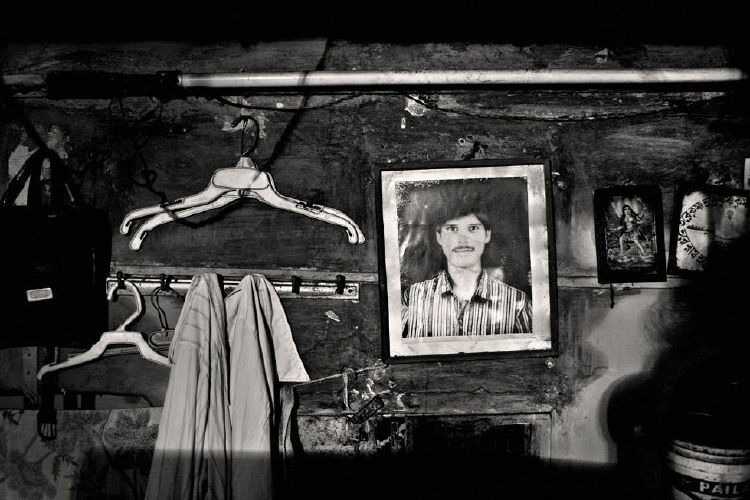 A portrait of died family member hanging in the wall. 18. A old woman sits by her window and applies oil to her hair. Her son is a member of the workforce now and is rarely home leaving her with little option but to quite literally sit by the window and watch the world go by. 19. 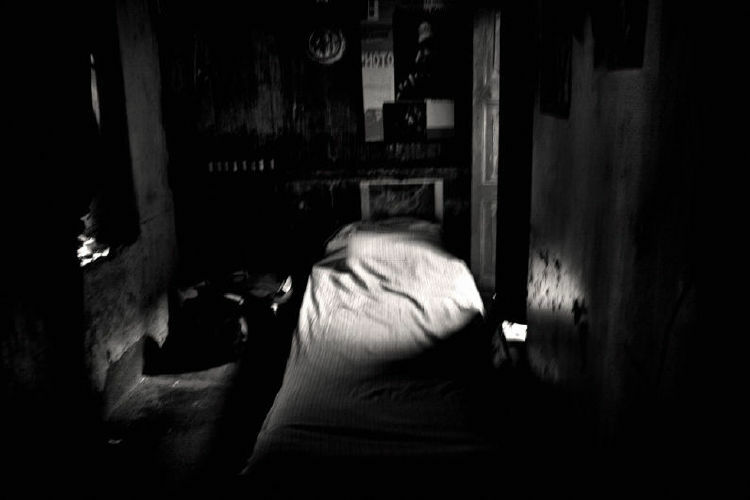 A view of a sleeping room. 20. 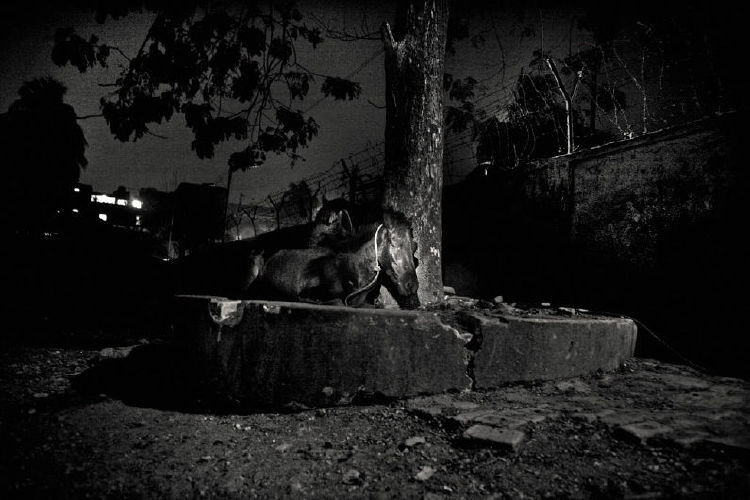 Horses are taking rest in the open playground in Bakshibazar. 21. 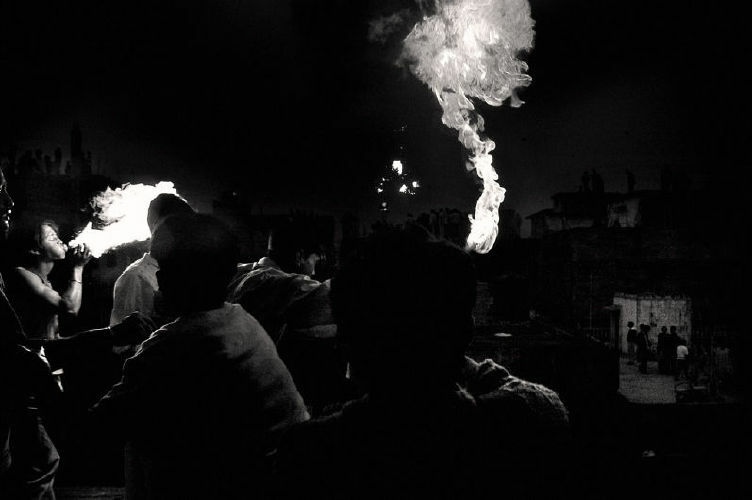 The feeling of community togetherness is rampant in this picture as people flock to their rooftops to watch performers spewing fire from their mouths in Shakharibazar. 22. People are talking bath in the streets at night. 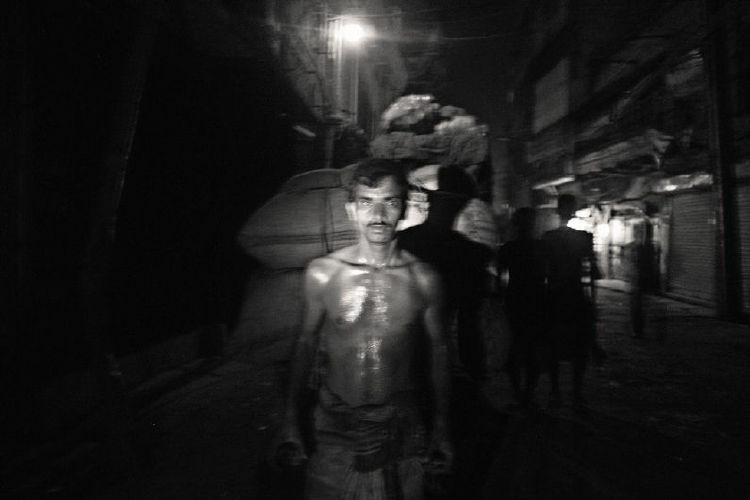 23.The labours are carrying raw material in midnight. 24. 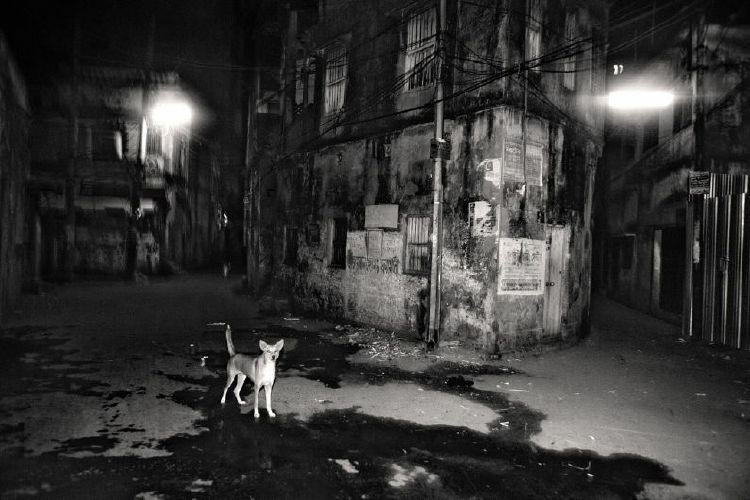 A dog is standing in the middle of the road in Old Dhaka. 25. A child is skipping in front of her house. 26. 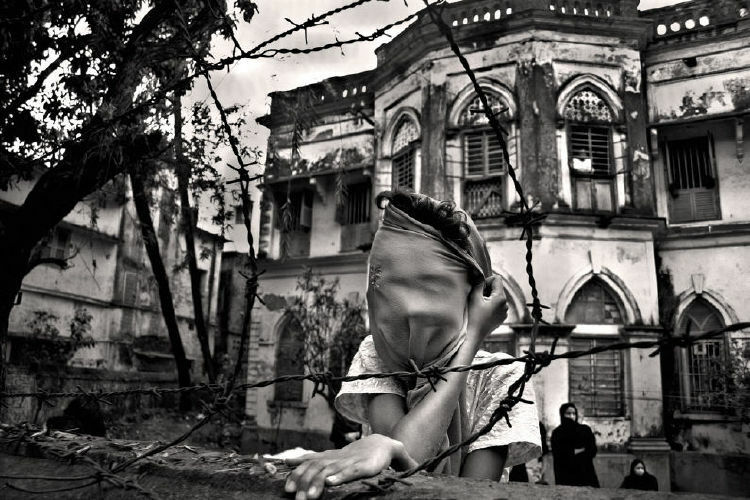 A child hides her face as a Muharram procession goes by on the Hosnedalan avenue. 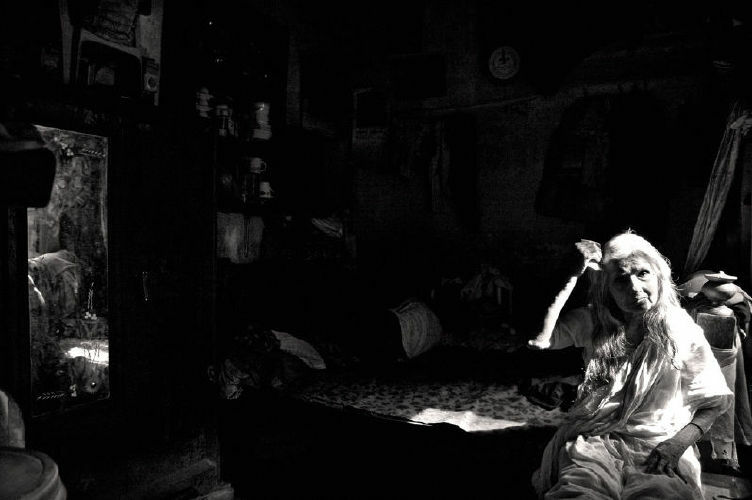 Beyond are a score of women dressed in burkhas who disperse the moment I go to photograph them. 27. Its midday and the truck driver is less than pleased at having to negotiate through such dreadful traffic. Loading and unloading goods are their daily jobs and although there are cows to help bear the weight it is not always the easiest of tasks. 28. 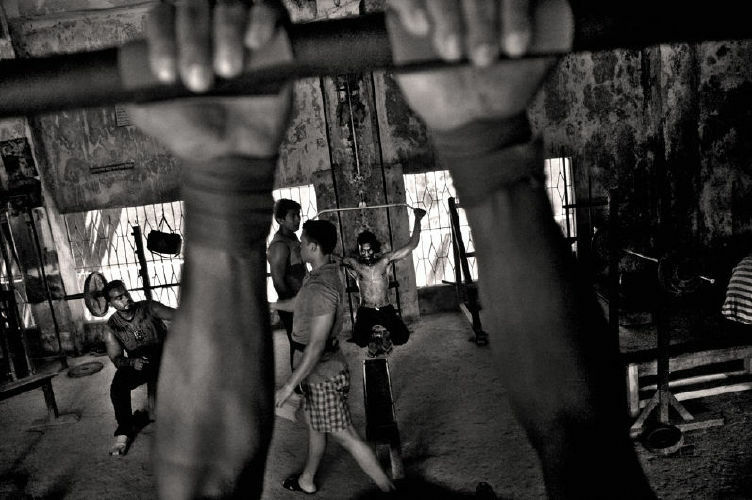 The oldest gym in Dhaka and quite possibly the entire country. With old school Hindi music blaring loudly from the speakers and a poster of Sanjay Dutt adorned on the wall, these gym goers have about them a certain swagger that is catchy. 29. 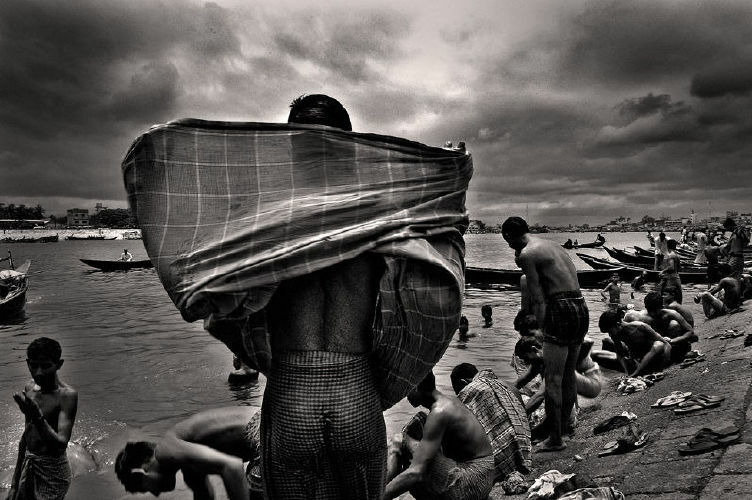 People are talking in bath in the river Buriganga. 30. A band plays before a wedding as people watch from their houses. Such scenes are still a novelty in those parts. 31. A joint family is ecstatic while celebrating Holi (the colour festival). Brother-in-law, Sister-in- law and wife of the house all celebrate showcasing the feeling of togetherness during a festival. 32. A mixture of the old and new. A butcher smiles as an ator dealer advertises his products in Koshaitoli, a local hangout for butchers. Pictured in his case are the youngsters who seem strangely smitten by it all. 33. 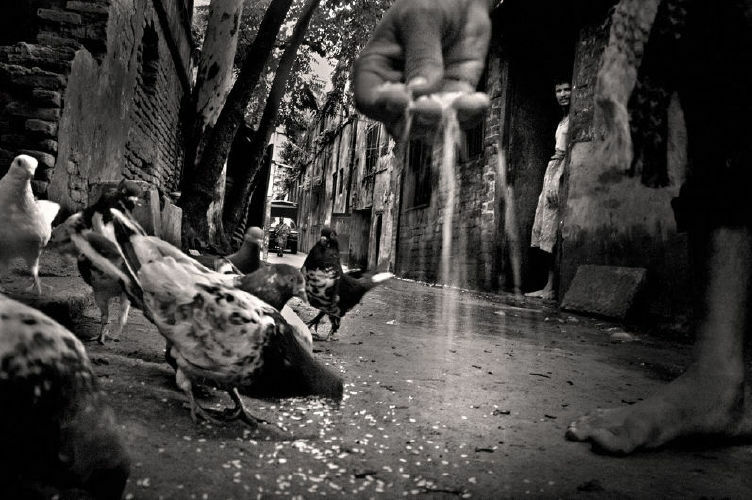 A labourer from a biscuit factory provides crumbs to pigeons during his break. He harbours a feeling for these birds and performs this daily ritual. 34. In the early hours of the morning shops are yet to be opened. 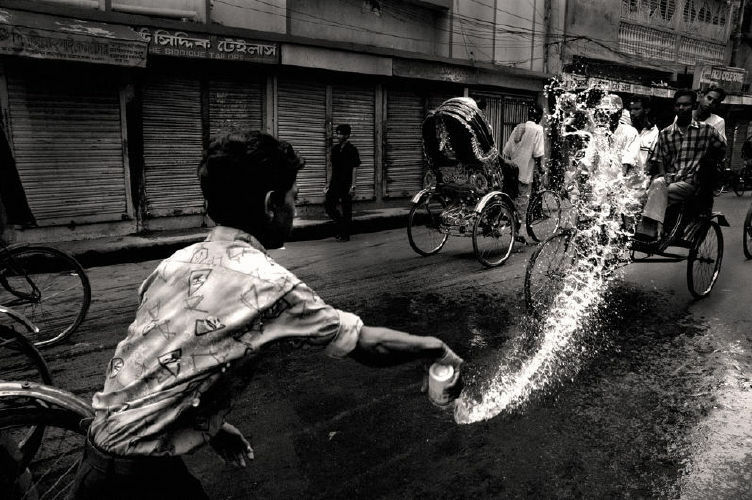 A boy is throwing water on the street to settle the dust that will raise as soon as the daily activity begins. 35. I took this picture in front of the gorgeous building called the Rose Garden (a pleasure lodge built by a Hindu zamindar in the late 19th century at K.M Das lane in the Narinda quarter of Old Dhaka and later purchased by Khan Bahadur Abdur Rashid) now used for filming of movies. It is one of the historical buildings of old Dhaka. |2012-07-08 11:33:41 Kazi Riasat Alve - Great! |2012-05-05 23:35:14 Kazi Riasat Alve - Really great! 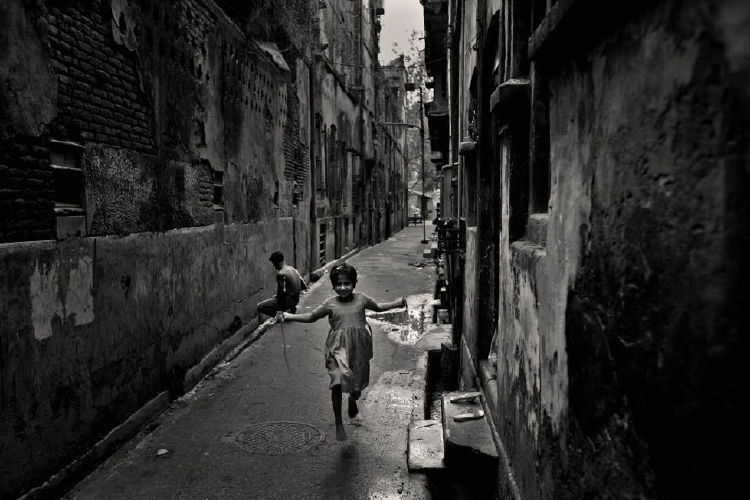 It is wonderful to know old Dhaka through these images. 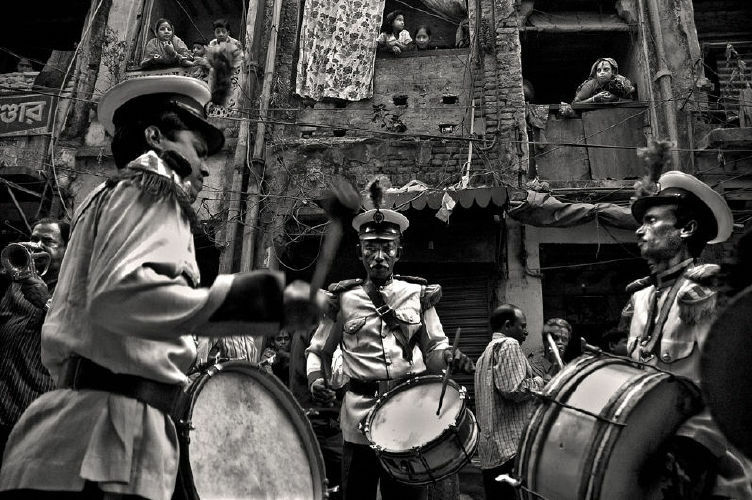 They make you understand the people, their life and rituals and they make you nostalgic too. 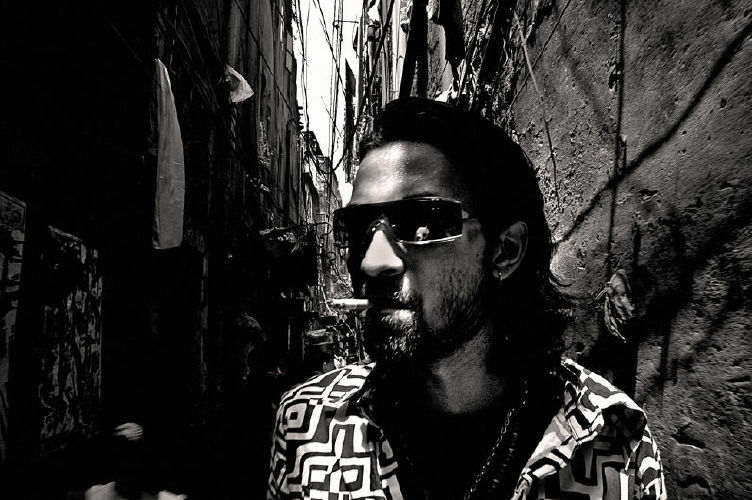 hey bro....its a wonderful album really loved the idea and the drama u created thru ur lens!! i seek ur permission to use ur images in my work....thnx a ton for d wonderful experience!! khubi shundor....eto simple jinish eto shundor lagte pare age bujhi nai...thnx man!! MIS MAS HUMILDES Y GRANDES FELICITACIONES POR ESTE TRABAJO. ME DIO MUCHA PLACER VERLO UNA Y OTRA VEZ. ME REAVIVO MUCHAS GANS DE RETOMAR EL B&N EN MIS NUEVAS HISTORIAS. REALMENTE CREO QUE ESTO DEBERIA SER PRESENTADO EN MUCHOS CONCURSOS. I've said this before and I'll say it again - This is an "Incredible series!!" I just found this out online and couldn't resist to have one more look Wasif bhai. A wonderful collection of photographs! 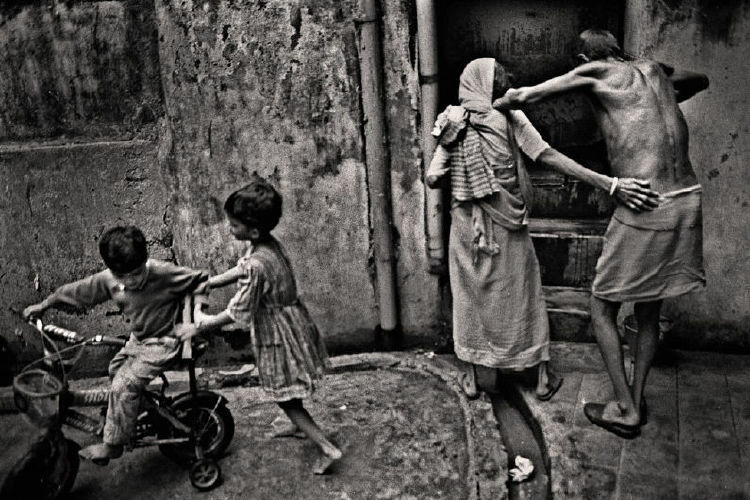 They combine the strength and poetic elegance of Eugene Smith and Cartier Bresson. 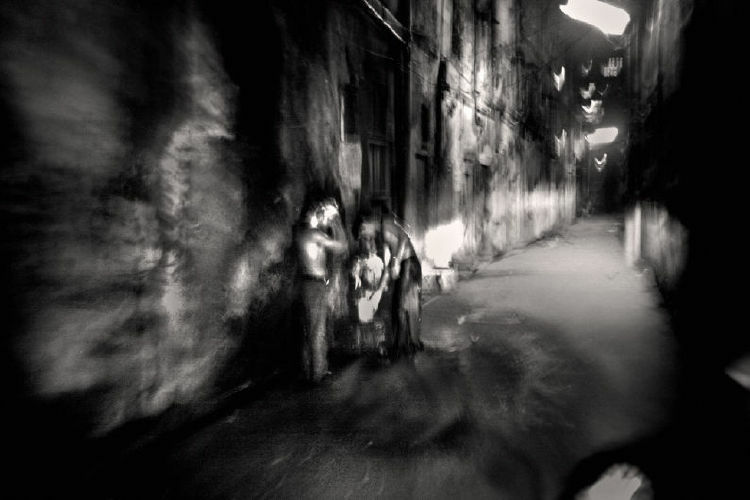 The harsh lighting, bright highlights and deep shadows, reveal the realities of life. These pictures are as living as the real people depicted in them. Not only the decisive moments, but the captured compositions in motion, reveal the creative genius of this great photographer. Indeed, the work of a great artist. an Indian photographer, 79 years old, living in Pondicherry, India. Originally from Calcutta. |2010-05-10 13:25:04 ladislav - breathtaking! really strong serie. unique photos. thanks and congratulation, Munem!